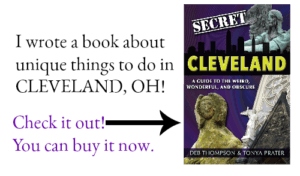 Looking for a destination to go glamping in Ohio? 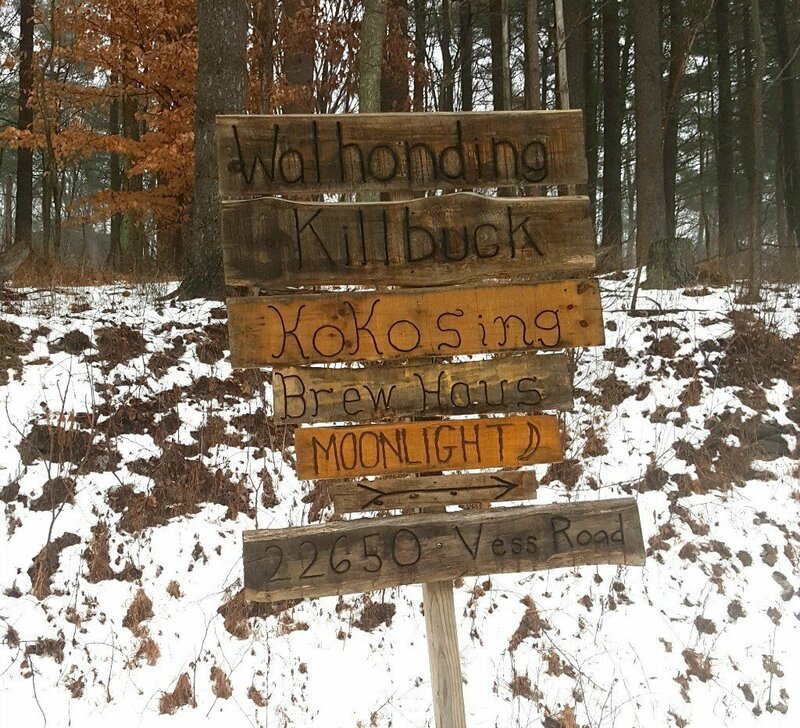 Check out the Killbuck Cabin at the Mohicans. In addition to cabins, you’ll also find a treehouse village. The weather was unseasonably warm for January and in town, the snow had pretty much melted off the roads. We loaded up, hopped in our minivan and headed off to celebrate my husband’s 46th birthday. And ladies, if the thought of nearing the big FIVE-OH bothers you, you’ve not met my husband. Just throwing that out there. 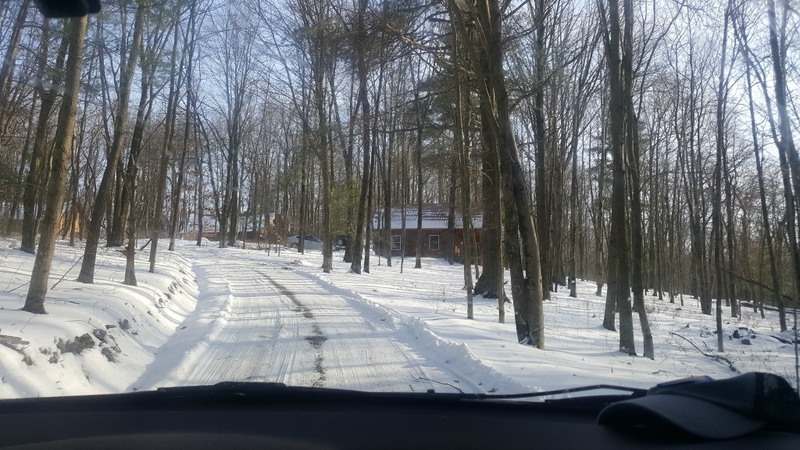 Driving along the narrow country roads with a wintry residue of snow and slush, I began to regret our decision to leave our 4-wheel drive truck behind at home in favor of our minivan. The feeling only intensified as we began our ascent to the cabin. Despite having brand new tires, my vehicle would not make the climb to the parking area in front of the cabin. This, my friends, is why one should heed the directions The Mohicans sends to you upon reserving your cabin or treehouse. It plainly states that 4-wheel drive vehicles are strongly encouraged during the winter. Other guests emerged from their dwellings to provide assistance and remind me of that fact, as well. Just stamp my head with a big “L”. Our kids, who were meeting us at the property didn’t have any issues and one drives a Dodge Dart. My husband backed down the hill and got a running start. Twice. On the third attempt, our minivan had made it to the top of the hill, among claps and cheers from other guests. It was epic. And maybe a bit exaggerated. Before I go on, allow me to mention that if our third attempt would have been met with failure, we could have parked in the main parking area and traipsed along the trail to the cabin. This is only a five-minute walk on a trail through the woods, which would have been enjoyable, especially on an unseasonably warm January day. MORAL OF THE STORY– Always pay attention to the advice of the property owners, even if you’ve visited before and think you know it all. 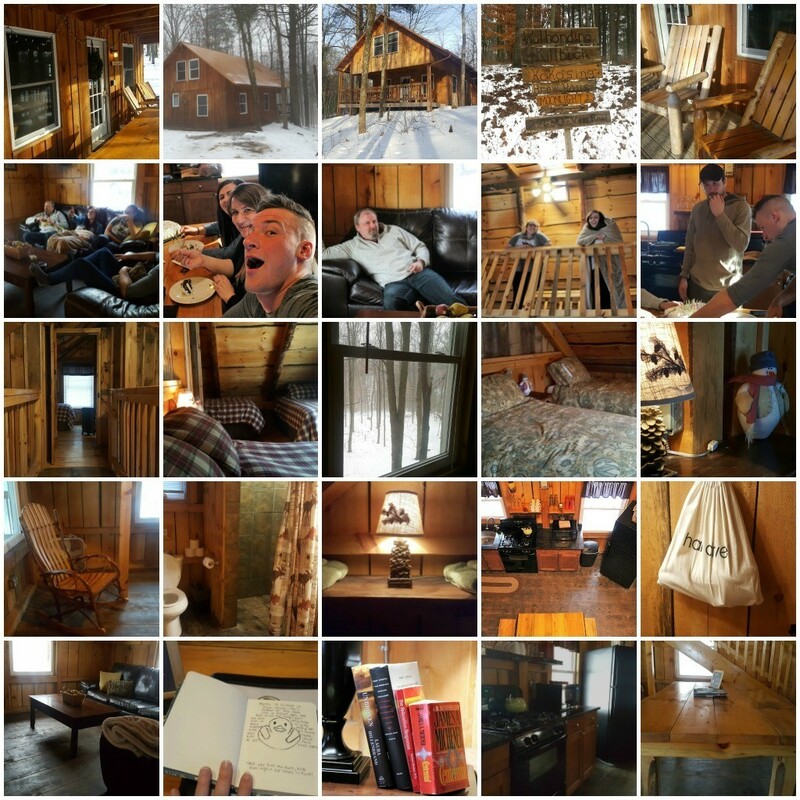 After our harrowing ascent, which gave us all a laugh, we settled into the cabin. 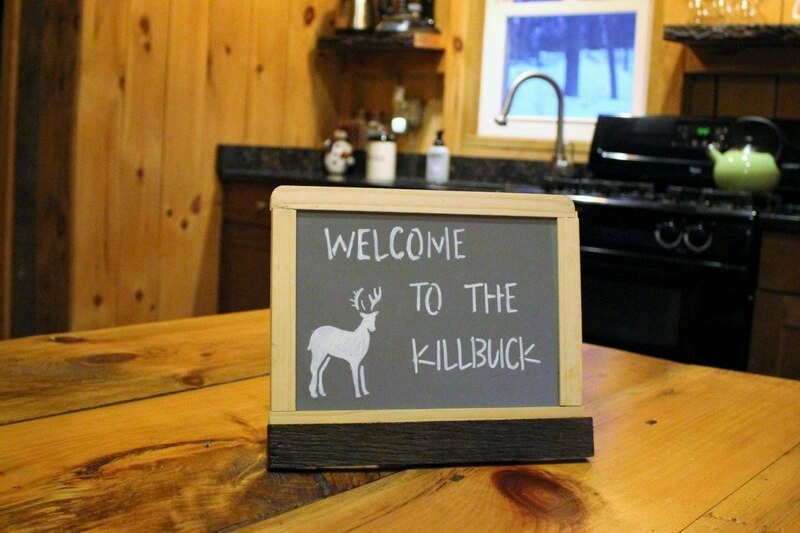 The first thing I noticed upon opening the door was the “Welcome to Killbuck Cabin” sign that greeted us at the kitchen table. 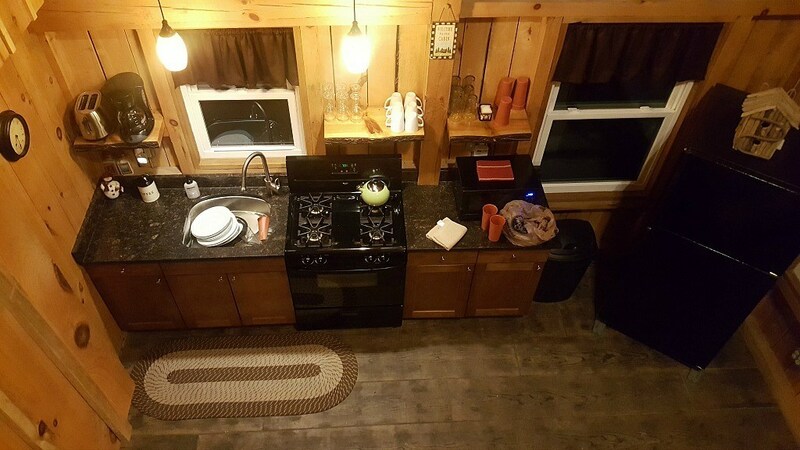 The rustic cabin features an open floor plan with a full bath, living and dining area and kitchen on the first floor. The second floor has two bedrooms with room to sleep up to 8 guests. 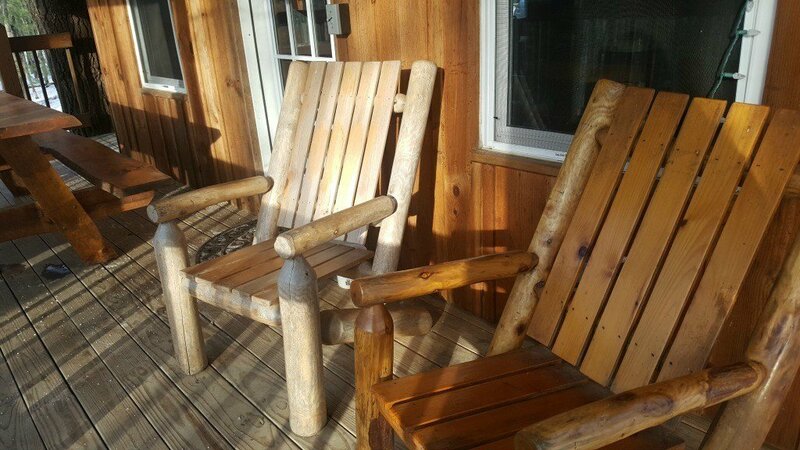 A deck on the front of the cabin overlooks the wooded property and provides two chairs and a picnic table for guests to enjoy the peaceful view. This would be an especially welcome feature during warmer weather. 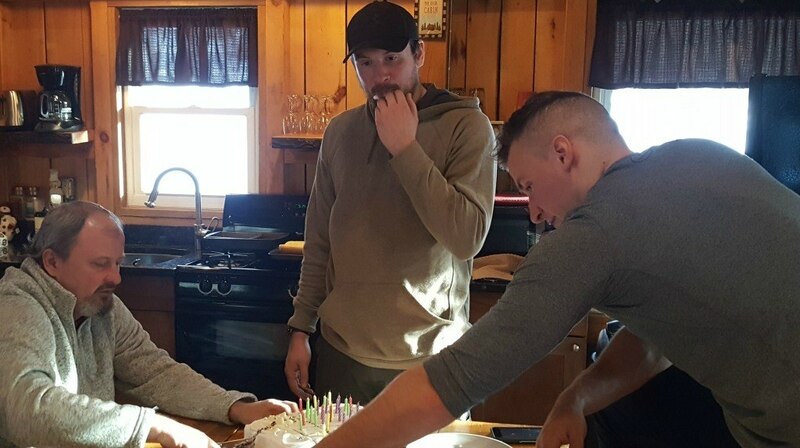 The kids, who had arrived before my husband and me, had only joined us for dinner and birthday cake. They were there just long enough to snoop around the cabin. The very first thing they commented on was the amazing luxurious bedding- which is seriously the best. I really think The Mohicans should offer an option for guests to purchase the comforter and duvet cover upon leaving. Especially since each one of my kids has requested one for Christmas next year! 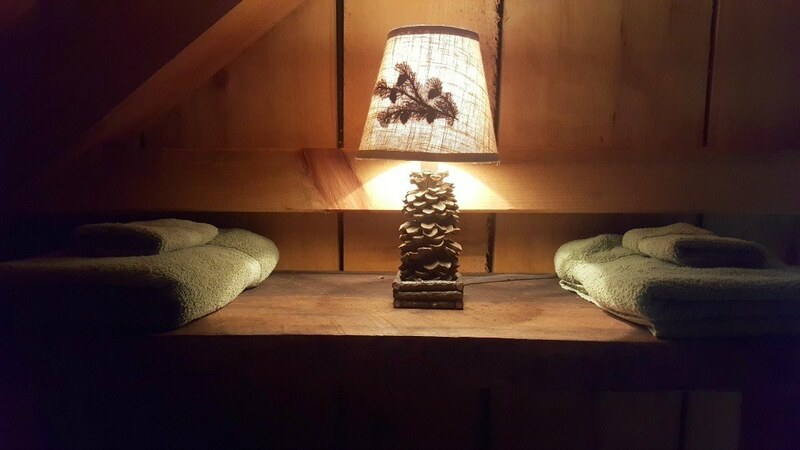 When my husband and I stayed in the Old Pine treehouse, a previous guest had left behind “an idol” for everyone to find. 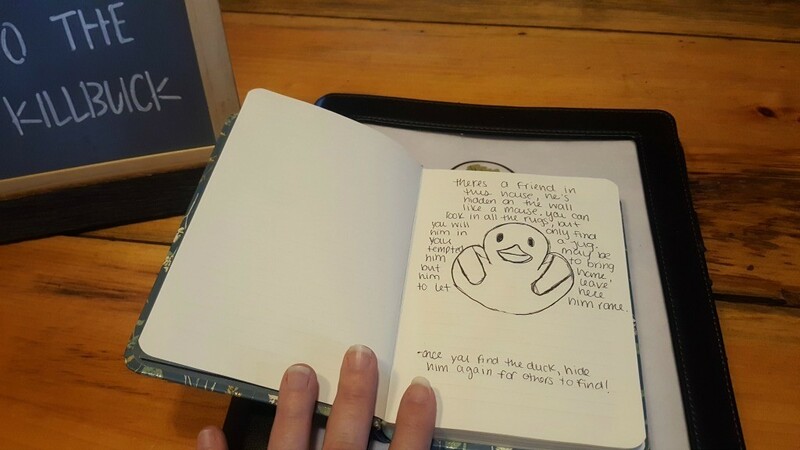 They recorded it in the guest book with clues and it had been hidden and rehidden many times. My husband shared the idol story with my kids who immediately felt Killbuck needed one too. My oldest son found a trinket in his car which we hid in the cabin for the next guest to find. The kitchen is well-stocked with pots, pans, silverware, and dinnerware for ten people. I only needed to pack the ingredients for our meal and a large baking dish to bake lasagna. I also packed some aluminum foil to line the oven in case the sauce boiled over. I didn’t want to make a mess. 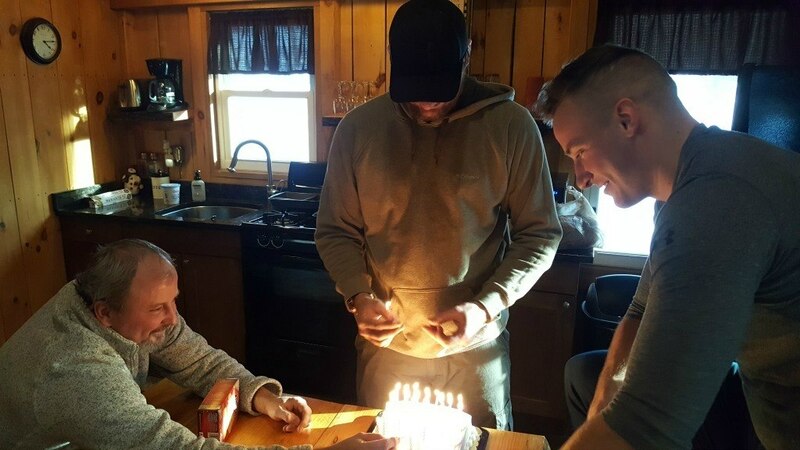 We ate our dinner and celebrated with cake before the kids headed home to enjoy their Saturday night with friends, leaving my husband and me in the cabin alone. I was a little bit disappointed that my husband had not picked up any DVD’s for our getaway. A TV and a DVD player is provided for guests to watch movies as there is no satellite or cable to the cabins or treehouses. And while I did have cell service when we stayed on the property in the Old Pine Treehouse, it was fleeting in the cabin. We found a few books on an end table in the living room and decided to read one aloud. Unbroken: A World War II Story of Survival, Resilience, and Redemption by Laura Hillenbrand, is the true story of Olympian Louis Zamperini, whose plane crashed during WWII when he was serving in the military. He was captured by the Japanese, imprisoned in a POW camp and tortured daily by one of the officers in the camp. 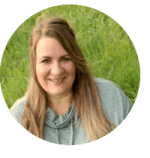 It is a beautiful story of faith and forgiveness and while my husband and I have both watched the movie, we enjoyed what we read of the book so much that I think I’m going to buy it, so we can continue to read it at home. We enjoyed our read-aloud session so much that we’ve decided to pack books when we’re van camping too. 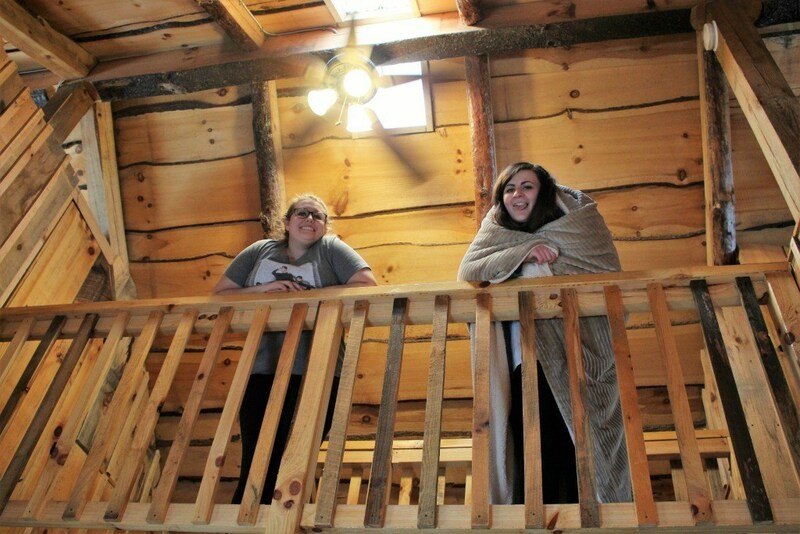 The cabin was warm and cozy. With central heat and incredible heated floors, we stayed nice and toasty. I’ve already mentioned how much I love the bedding and the bed was extremely comfortable. 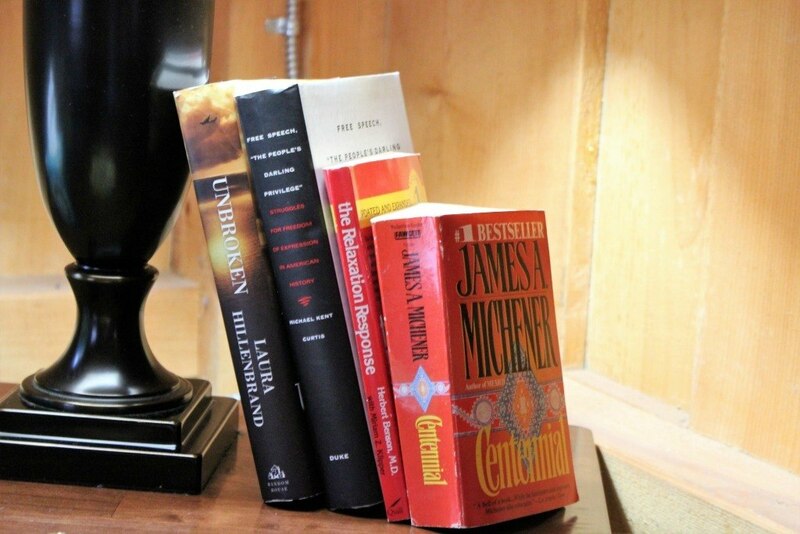 The only thing I would suggest is that it’s quiet at The Mohicans – which is GREAT!- but, if you’re used to a bit of traffic or noise while you’re sleeping, you may opt to plug in one of the fans they provide, pack a portable sound machine (affiliate link) or download an app with white noise. 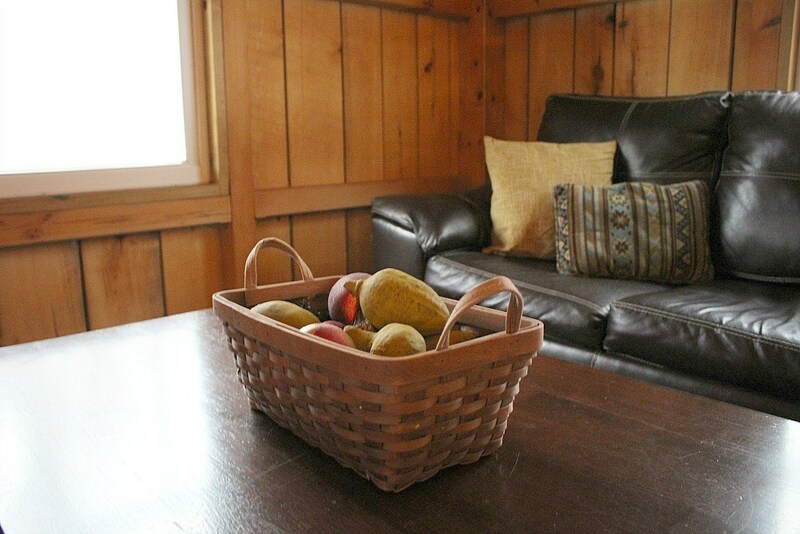 I love all the details that make the Killbuck Cabin a comfortable retreat away from home. The decorative touches, heated floors, comfortable furnishings, plush towels, Mrs. Meyers soap and Kirkland hand lotion, and the string of white lights outside the cabin that lend a touch of magic to the treehouse and cabin village. The folks at The Mohicans want to make it easy for you to get away- whether it’s a romantic couple getaway or a time away for the family. The linens and towels are provided as well as most of the kitchen items you’ll need to be comfortable. The kitchen has a microwave, stove, oven and full-size refrigerator so you can pack in your groceries and prepare your own tasty meals. If you have an aversion to washing dishes on vacation, feel free to pack your own paper plates and plasticware. You will want to pack your own spices, storage containers, paper towels/napkins, extra garbage bags if you’ll be there longer than one or two nights and any specialty items that you may need like a roaster or blender. A coffee maker and teapot (which I LOVE) are provided with complimentary coffee and tea. If you prefer to dine out, a local binder is provided for guests with suggestions of area restaurants and attractions. You’ll also want to pack your own toiletries like bath soap and shampoo and conditioner. If you plan to take advantage of the outdoor fire pit or grill, you’ll want to pack in some firewood and camp chairs and charcoal with lighter fluid and matches. Feel free to traipse through the woods on the property or pack your fishing pools to fish in the pond. If you get dirty or muddy, you can wash off in the outdoor shower before entering the cabin- another feature that is perfect for summer trips. 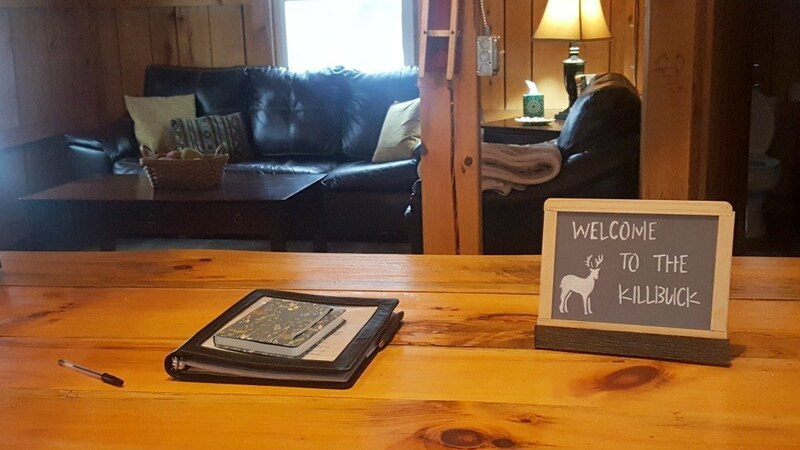 The cabins don’t have wi-fi and depending on your provider, you may not have internet access or cell phone service while staying at the property. I have Verizon, which does work in some locations on site, but didn’t work well in the Killbuck Cabin so make sure you pack plenty of activities (DVD’s, board games and a deck of cards) to keep yourself occupied. This is the ideal getaway for those who really want to get away from it all. 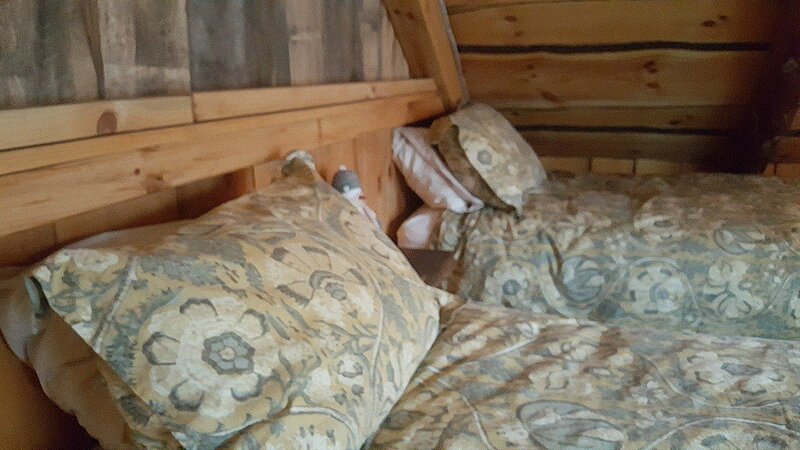 There are two bedrooms in the Killbuck Cabin. 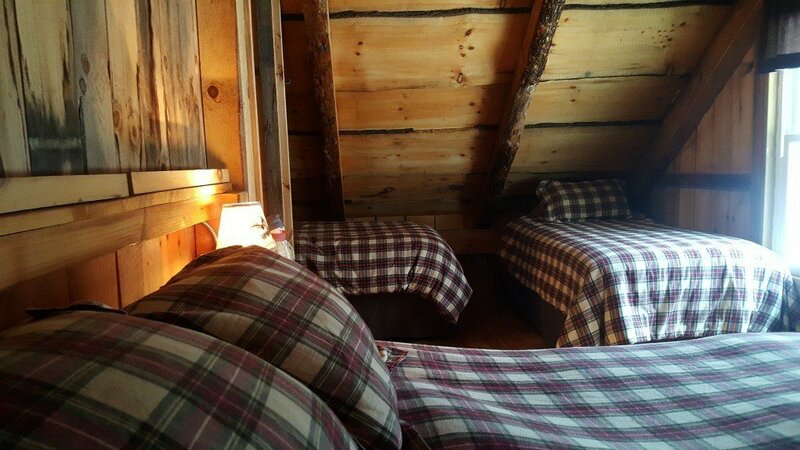 One bedroom has three twin size beds and a great view overlooking the woods. The second bedroom has a queen size bed and two twins. The leather couch is also available for sleeping if needed. If you’re looking for the perfect glamping in Ohio getaway, I can’t think of a better option than The Mohicans. 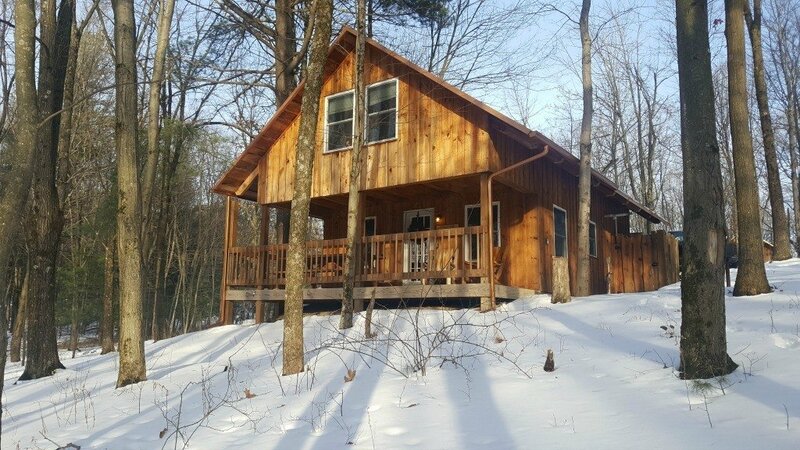 The Killbuck cabin gets a thumbs up from everyone in my family and the kids would love to return when they don’t have plans and can stay the entire evening. Don’t forget, you can also book a stay in one of the six treehouses on the property. You can read about our stay in the Old Pine Treehouse and keep an eye out for my review of our latest stay in the Tin Shed Treehouse. The Mohicans are probably the most unique place that I have ever stayed. With four cabins on site that sleep up to 15 and six treehouses (with more on the way), this destination just keeps getting better and better. You can read the reviews on Tripadvisor here ——> Reviews of The Mohicans (affiliate link) and check availability to book your stay here ——> The Mohicans. The Mohicans is a popular wedding venue and the cabins and treehouses are offered to wedding guests before they are available to the public. If you’d like to book a stay, but the date is reserved, check back as dates do sometimes open up. If you’re looking for ideas of things to do during your stay at The Mohicans, I can provide some options. Nearby Loudonville is nicknamed “the canoe capital of Ohio” and is a great destination for outdoor recreation. Hike in the Mohican State Park and Forest, take a canoe trip down the Mohican River, zip line at Tree Frog Canopy, or explore the thrift store or shops in downtown Loudonville. If you enjoy driving the backroads, take a drive along the Wally Road Byway. Don’t forget your binoculars, you may catch a glimpse of Bald Eagles. Amish Country is also a short drive from The Mohicans. Browse the bakeries for authentic Amish baked goods, visit the many boutiques, shops, and antique stores, enjoy cheese and wine tasting, or opt to visit an Amish home and ride in a horse and buggy.